Anyone can recommend a throwaway flashlight. And to be honest most flashlights available online are cheap replicas of proven designs or are cheaply made. Yes, they can represent a good value because they offer LED bulbs and fairly bright lighting, but they are not made well, and they tend to fail at the most inopportune times. The best and Brightest Tactical flashlight will not always be the most expensive, but the one that you can count on will be an accurate presentation of what is available at the top tier for these types of lights. The number of lumens it gives off will be a fair representation instead of an overinflated bit of marketing hype. The finest quality tactical lights can work under all conditions and will blow the competition away with their attention to detail, ease of use and sophisticated builds that make it easy for the user to put it into action. This article is focused on legitimately showcasing the finest flashlights on the planet, with the brightest tactical flashlights that have proven to be accurate and long-lasting in their use in real world scenarios. This is not a random collection of best sellers that represent the needs of inexperienced users, this is a well vetted list of the brightest tactical flashlights that can be used in some of the worlds harshest environments and still survive to be used again. 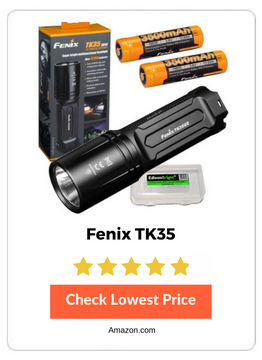 The resulting average price of the flashlights in this list are significantly higher than most of the lists already available on line, and it is our desire to ensure that you find the top tier offerings rather than some cheap knockoff brand that doesn’t have service after the sale. If you take the exact definition of a Lumen, it seems to be more complicated than it actually is. The definition is as follows: the SI unit of luminous flux, equal to the amount of light emitted per second in a unit solid angle of one steradian from a uniform source of one candela. The reality of the lumen variable is that the higher the number, the brighter a light will appear. There is a point at which lumens begin to demonstrate a diminishing return. At that point, a flashlight must be of significantly higher lumen count relative to another to show a substantial perceived increase in brightness relative to another light. It’s exceptionally important to understand that Lumen count is a focal point for fraudulent claims. It is the single factor that is targeted by marketers and outright fraudsters who are trying to sell an inferior light, at a shockingly low price as a better light than it actually is. Smoke and mirrors have always been a part of the marketing landscape for new technology, in this case it’s LEDs and Mirrors. The lumen counts in this article are very accurate. 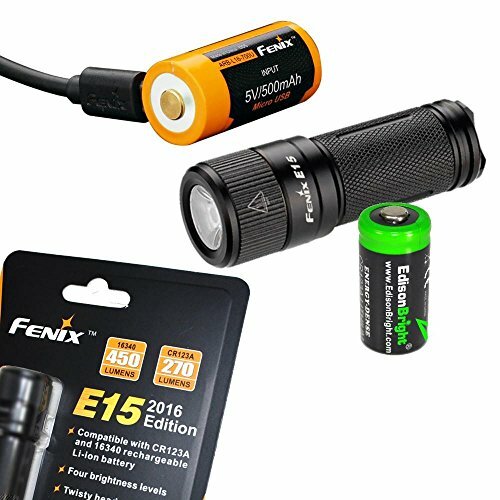 The backing for that statement is deeply rooted in the fact that the companies that make the flashlights are very credible on their own, but also because these lights, relative to their peers, are significantly the outperforming devices, when put head to head with cheaper, lower quality options. The reality is that most claims of lumen count are ridiculously over the top and generally, when it comes to the pirated technology or the stolen aesthetics that come with most bargain versions of the newest tactical flashlights, they are outright lies. Most LED’s in the cheaper versions of the newest tactical flashlight for under $50 are copies made with inferior materials, of the brand name LED’s that are selected for the brightest tactical flashlights. The brightest flashlight will have a top-quality LED bulb – not a knock off, of unproven capability. For that matter, it’s important to recognize that there is no other type of bulb at this point for the best tactical flashlights. It’s ALL about the LED now. The life expectancy, improved color shading and general benefits of the LED bulb are so advanced at this point, that no other bulb type will ever be able to be placed in a top tier tactical flashlight until a massive innovation in technology is available, for now, the LED is safe where it is at. Xenon bulbs are expensive and while they can be competitive in thrown and lumen output, they simply are too hard to find and cost too much to stay in the race for innovation in the flashlight technology spectrum. There is nothing wrong with buying a cheap LED flashlight for tactical or general use purposes, but there must be a good understanding of the capabilities of the flashlight you choose. 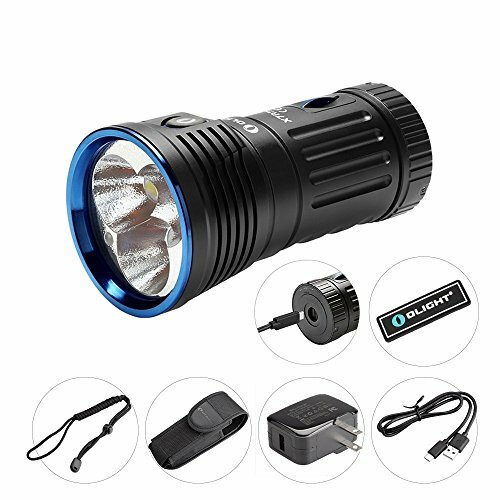 This list will not feature any fake flashlights, and the general price point will be significantly higher for the lights on this list compared to the cheap knock offs. If you determine a cheap flashlight is the way to go, expect to use more batteries for less output of light and to need to replace it as a working tool faster than other lights. Note: many serious users of top quality flashlights also employ the services of cheaper, lower quality tactical flashlights but they are ordinarily used in general use settings where reliability and power may not be as important a factor. The output can be directly related to the power source. The two major battery types are the 18650 and the 16340 (CR123A). Outside of the tactical flashlights that utilize removable batteries many of the best tactical lights utilize internal batteries for a combination of reasons. One reasons is the control of the circuitry that allows for these high-power flashlights to maintain comfortable, safe temperatures and prevent internal damage through over use of the circuits. Another reason is to add enhanced capacity or increased “bandwidth” through higher voltages. The enhanced circuitry and having a proprietary internal power source allows additional attention to detail in the charging source. This allows better harmony between component parts which allows for a larger amount of influence over how the parts work together – less aftermarket parts and less opportunity for failure. 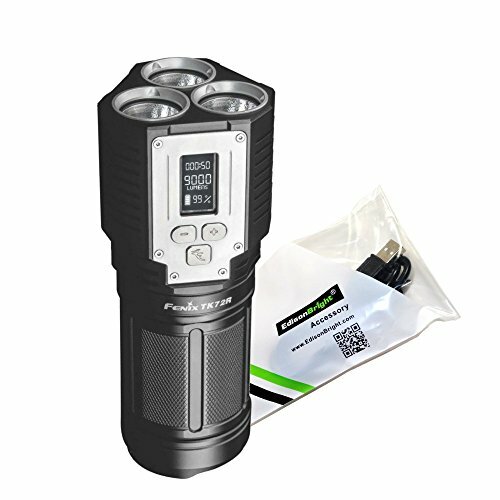 For the devices on this tactical flashlight reviews list, the quality control and brand service levels are quite high across the board, so, in the case of a failure, which will be much rarer than with knock-off lights, you will have a company who stands behind their product. As a matter of course, batteries are also a target for ridiculous claims. The reigning champion of tactical flashlight batteries of the removable variety is the 18650. The claims from different battery manufacturers about the life expectancy or the actual outputs of these batteries is an exercise in ridiculousness at best. The chance for fake batteries in legitimate brand wrappers is very high. You have a realistic chance of buying fake batteries and being burned by them – literally. Some of the fake batteries have significant risk of catching fire, and other concerns. Buying the top-quality brands that offer 18650 batteries will give you a legitimate chance of success in top tier flashlights. Great 18650’s and 16340’s produce the brightest flashlight. Using the proper voltage and power sources when charging internal battery packs also contributes to the performance of the luminous flux of the lights you use and need to count on. Throw is a term that explains the focal point of a beam upon a surface in the distance. The longer the throw is, the further that a spotlight can be illuminated on the surface. The throw is a specific representation of the combination of the brightness of the light and the reflectiveness and angle of the reflector system, including surface texture and other component variables. Flood type lights are those which attempt to shorten the throw to allow for a more usable effect in the short term distance from the user which allows a larger field of view to be illuminated to improve situational awareness, among other aspects for the user. Usually a light can pick one or the other in design, but some lights are “throwers” that also have flood effects as overspill. That said, they each have their purposes. A hard throwing light would be less useful in a room clearing operation where the light would be a small pinpoint compared to the need for a large amount of light in a small amount of space. In addition, using a flood light to illuminate a threat to deescalate a potential problem at a long distance requires a focused beam. Deciding a personal preference can be a hard choice because different situations require different actions. Fortunately, there are some tactical flashlights that give adjustable beams that can alter the throw a bit. Additionally, there are flashlights that have so much light output that some clear overflow light will allow for a long-distance thrower to have a flood effect in immediate and intermediate areas. The truth about flashlights is that the best tactical flashlight is the one you have on you when you need it. For those who are not tactical operators or who don’t have a job that necessitates full time carrying of a larger flashlight, size matters. The smaller the size, while still offering adequate light output – the easier it is to always have a light with you. 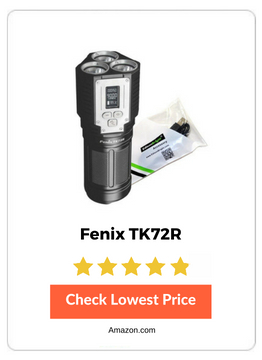 Part of these flashlight reviews is helping you to find a tool that is usable as often as possible. Size facilitates more frequent carry, and thus, more usability. Brand credibility and material choice are a major factor both in pricing, and in capability for your flashlight. Top tier brands do not skimp. Sure, every brand can tout “aircraft aluminum” or “CREE LEDs”, but not all flashlights offer the top products in the CREE portfolio, or the highest quality alloys of aluminum, or titanium for that matter. Materials mean something with regards to longevity, capability and everyday use. These qualities help to make up a well rounded flashlight. What you must do now, is determine which attributes make the most sense applying to what you wish to accomplish. 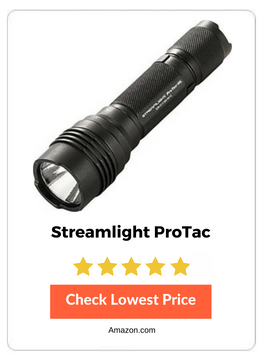 Streamlight 88040 ProTac is a very nice choice for those who need an inexpensive, mid-sized tactical flashlight that has good throw and a powerful general use beam type. Three settings and 3 different option sets for those settings with quality materials and multiple colors, in case your idea of tactical includes pink or blue anodized aircraft grade aluminum. WHY IT IS RECOMMENDED: Streamlight is known for producing top quality duty flashlights, which are proven in legitimate scenarios over years of use. While this isn’t the top offering for duty use by Streamlight, this is a significant value for money and offers 3 modes to balance performance with longevity. OLIGHT offer some of the best materials and build quality in the tactical flashlight game, and this is a monster of a flood light for when you absolutely need to know what is in the surrounding area. 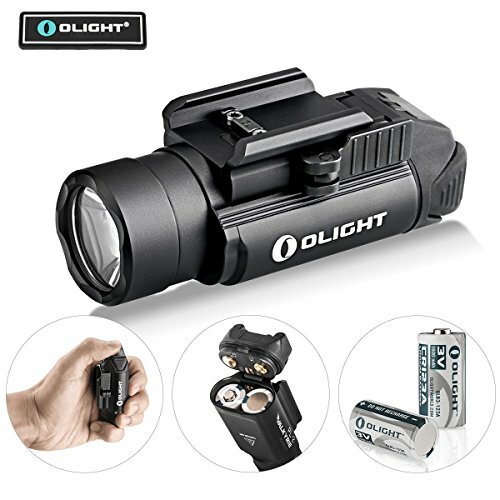 WHY IT IS RECOMMENDED: There is not a higher quality manufacturer across an entire portfolio of products as what OLIGHT offers. The materials and component parts are absolutely top tier. The brightness of the flood leaves nothing to chance in a true tactical scenario. As a weapon light, the Olight PL-2 Bundle is virtually unmatched for the money, with a low cost of entry, and a popular light style. The weakest link is the CR123 batteries, and that is a decent weak link to have as the service capacity of those batteries is high. WHY IT IS RECOMMENDED: OLIGHT quality and durability is legendary. The fact that the price point is so good only adds to the value proposition of this light. For those who want throw on their firearm, this is a potent offering. The world's Smallest & Brightest LED-flashlight - 4000 Lumens TM26 now Shipping! Nitecore is a very high-quality device; what’s more, the Nitecore batteries are some of the best on the market. The chargers and power source options are top notch. Four heads offer a blinding set of LEDs that give unprecedented throw for a lumen level of “only” 4000. WHY IT IS RECOMMENDED: This flashlight punches well above its weight class, and despite its hefty price point, it is an exceptional performer. 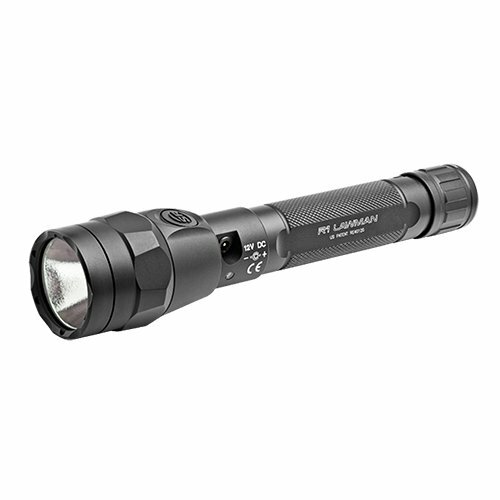 The NITECORE package that comes as part of this purchase adds to the value of the light and the continued performance of this great tactical flashlight. Although the Zebralight is not super bright and it uses a battery type that isn’t of peak output for the top-quality lights in this genre, but it is of exceptional build quality, and it has a long life with those supposedly inferior batteries. If you need an excuse to have a light with you full time this is a very nice option and it will last forever if treated properly. WHY IT IS RECOMMENDED: Built like a brick house and made for everyday carry in a pocket or even on a large keyring. This is not the most impressive light on paper for the money, but it’s not the numbers that makes this a top choice, it’s all the other intangibles and super high-quality build that puts the Zebralight at the top of the list for the tactical lights of this size and type. ThruNite ITC technology to prevents possible damage from overheating.Intelligent and ergonomic user-friendly interface. 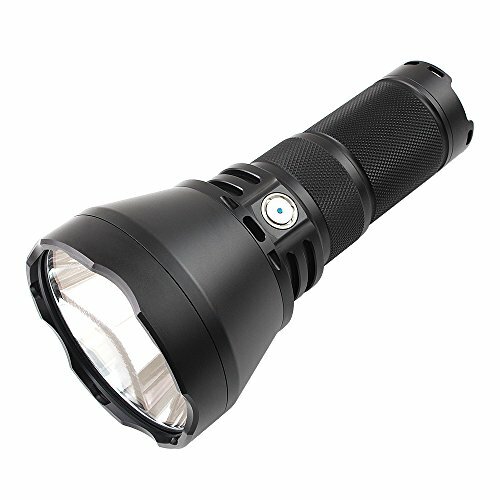 TN42 is equiped with 18650 battery holder, no battery come with flashlight. You won’t believe your eyes when you see the throw on the ThruNite TN42 light for what it costs to buy it. It is not the brightest, and the color scale tints bluish, but the light is exceptional for anything that you need real throw for. Almost unbelievable, but legitimate throw – almost a mile away. WHY IT IS RECOMMENDED: At a mile away, you can get legitimate light transfer, with this posing as one of the best mid-range search and rescue lights anywhere for the money. The ThruNite TN42 is much smaller than anything of it’s throw and much easier to operate than any of its much bigger competitors. The Fenix E15 is a purchase you won’t regret with the powerful lighting option fitting easily on a keychain and weighing less than a couple ounces with battery. The price will easily be forgotten when you recognize the utility. 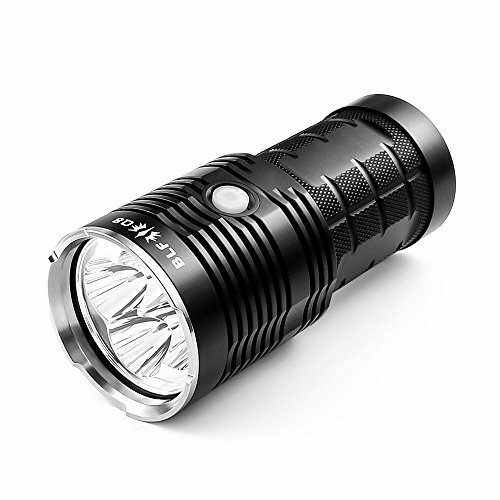 WHY IT IS RECOMMENDED: When you need a flashlight you never have one; with this Fenix E15, you will always have one. It is the epitome of “tactical”, to have planned for every eventuality. Highly Customizable: Q8 uses the latest NarsilM, which supporting multi channel output configurations. Users could set the interface as easy or complicated as you like. Kind Note:The BLF Q8 is a very powerful flashlight that requires some knowledge before and during use. Long Runtime: Runs off 4*18650 button top batteries lasting up to 1500 hours. Kind Note: The light is intended to be used with BUTTON TOP 18650 batteries(Not Included). We highly recommend the use of protected cells. 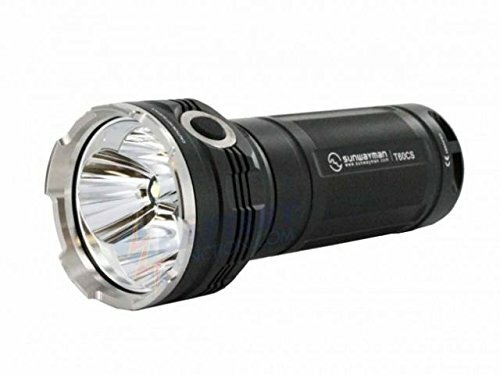 A collaboration between one of the largest flashlight specific internet forums and ThorFire, this is a competent light at a ridiculously low price that gives exceptional value for money. With high performance in lumen count and nice throw, this is a budget winner for those who need good throw and long life. WHY IT IS RECOMMENDED: The ThorFire is well made and has features and performance specifications that are legitimate. Yes, it’s not perfect; the settings can be odd to change; the materials aren’t the highest quality available, but the durability and materials are good enough, that when you pair that with the lumen count and throw, you find that the price is amazing for what you get. Bundle includes a EdisonBright brand USB charging cable. Some people online complain that Fenix is a company that rips off other intellectual property. In the case of the TK72R, the performance relative to other available options seems to point to the fact that Fenix got it right with this one, and that it is class leading. If you’re the best in class, why would you need to steal technology? We can’t say how true this allegation is, but for the money, this tactical flashlight is hard to beat. WHY IT IS RECOMMENDED: The versatility and capability of the Fenix TK72R light is amazing. The compact nature of the light paired with the flood type beam that still throws at 286m maximum, offers a legitimate all purpose tactical light that has no real competitors in build quality, versatility and outright performance for most of what you would want. Micro USB rechargeable battery holder; 2 X 3500mAh rechargeable batteries included. Bundle include EdisonBright BBX3 battery carry case. An upgrade to the previous version; and an upgrade to just about any flashlight that you’d be looking to replace. For the money, the performance is exceptional. 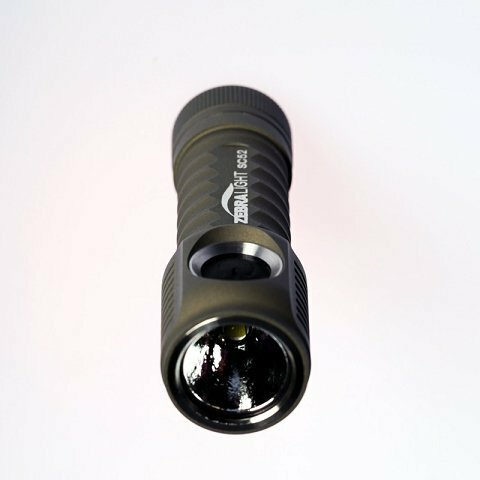 The Fenix TK35 is brightest tactical light in the size class. 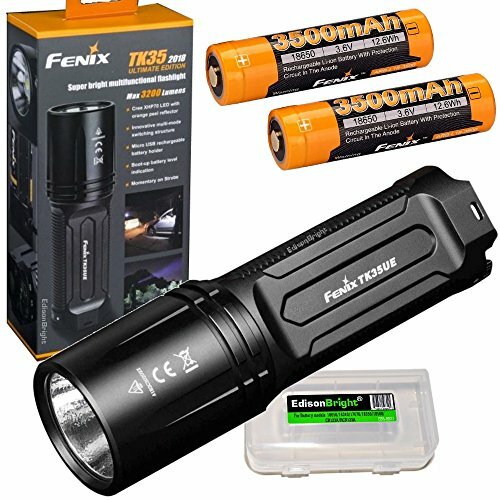 WHY IT IS RECOMMENDED: If you have the money to support the Fenix TK35 flashlight with the extra batteries of top quality manufacture, this is perhaps the best frequent-use flashlight in all the flashlight reviews in this list. The money you spend is well spent if you want the best performance and versatility in use. The SureFire R1 is not a novelty, even if the innovative technology seems like a novelty. The real question for users is: can you justify allowing yourself to be held hostage to a circuit board’s “brain” in a time when more light might be your wish, but the environment may not be able to justify it per the protocols of the light. That said, the technology alone can be a huge benefit for certain settings, especially when adrenaline is high, because you will get a proven track record of performance out of this SureFire light. WHY IT IS RECOMMENDED: It’s the second generation of a technology that is beginning to come into its own and will prove valuable in the future. For those who have a need for regulated power supply and don’t need extreme specifications, there are few lights that can compete on the same level with a SureFire R1, and with this as a duty light where you need to focus on other things. This is a great light for patrols where other ambient environmental lights will be able to aid in peripheral vision. Soft-contact Side Switch; In flashlight Charging with Optional charger. A nice, versatile light that will serve you well for a wide selection of use cases. The Sunwayman T60CS U2 is a top-quality offering from the Sunwayman brand, but it is also a stout performer among the field of competitors in the price range. WHY IT IS RECOMMENDED: Yes, it is pricey, but it is also a powerhouse, spec wise. The Sunwayman T60CS U2 is a solid performer in the price range and will offer good service and a smart power outlay. Some people carry a gun daily and never use it for 20+ years. Some never even draw it from a holster except during range use. The versatility and utility of a tactical flashlight extends beyond the occasional use in a dark room to flip a breaker box switch. When you force yourself to use a flashlight because it is near you and at your disposal, it becomes an almost inseparable part of you, whereby you have options when you need them. 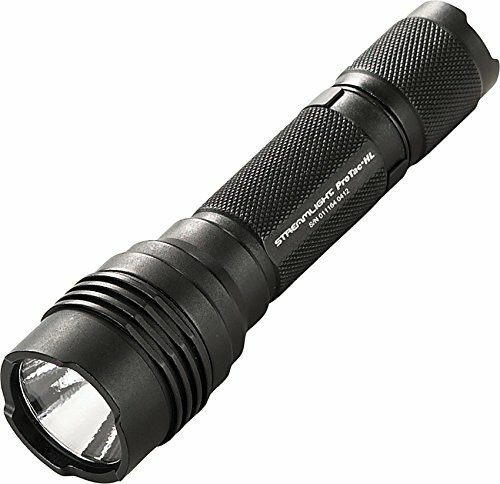 Yes, a flashlight doesn’t often have the same power to change an outcome as does a concealed carry gun in it’s element, but in a natural disaster or in an opportunity to deter a crime by shedding light on a shadow lurking behind a bush or a building, a flashlight will be incredibly useful. 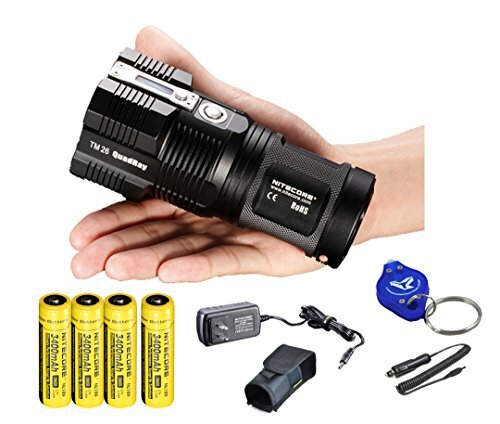 This list of flashlight reviews, seeks to help you to find, not only the brightest tactical flashlight, but the best flashlight for your unique considerations. Tactical flashlights need to be reliable and powerful. Be sure to read through the detailed reviews before choosing the best product for your needs. 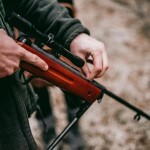 Best Car Gun Safes in 2019 - Reviews & Buyer's Guide!